Received 17 May 2011; revised 23 June 2011; accepted 19 July 2011.
peared in the past decade. Cyril Hopkins; Jonathan Cape; London. soil without loss of fertility for forty centuries” . sic is something rare, and for this bo ok, written by F. H.
seemingly mesmerised by, Occidental techno-fixes. 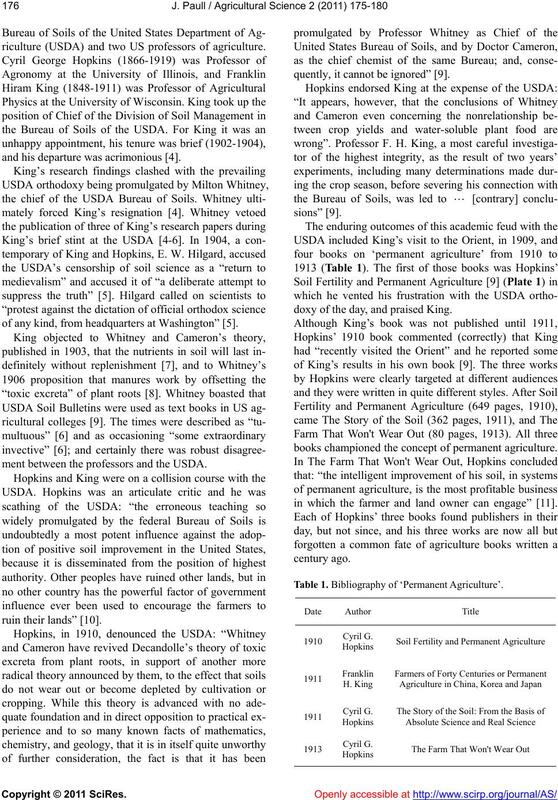 riculture (USDA) and two US professors of agriculture. and his departure was acrimonious . of any kind, from headquarters at Washington” . ment between the professors and the USDA. quently, it cannot be ignored” . doxy of the day, and praised King. books championed the concept of permanent agriculture. in which the farmer and land owner can engage” . Table 1. 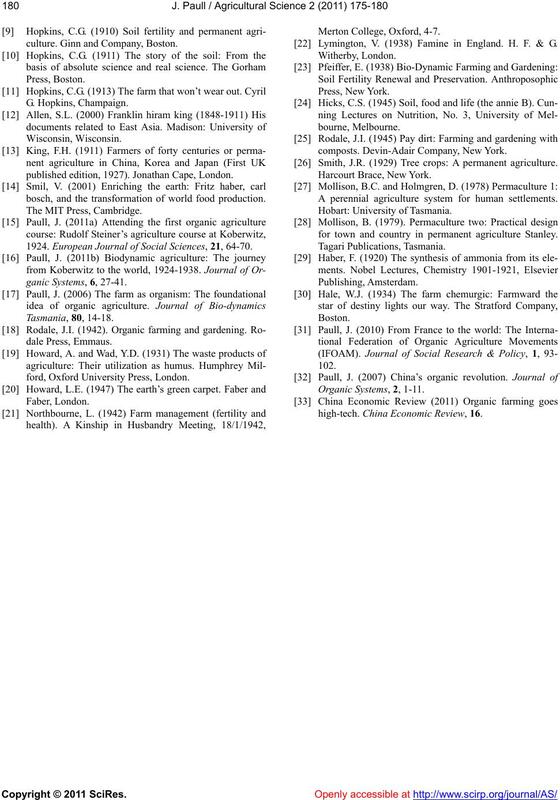 Bibliography of ‘Permanent Agriculture’. Agriculture’: Hopkins in 1910 (left); and King in 1911 (centre). 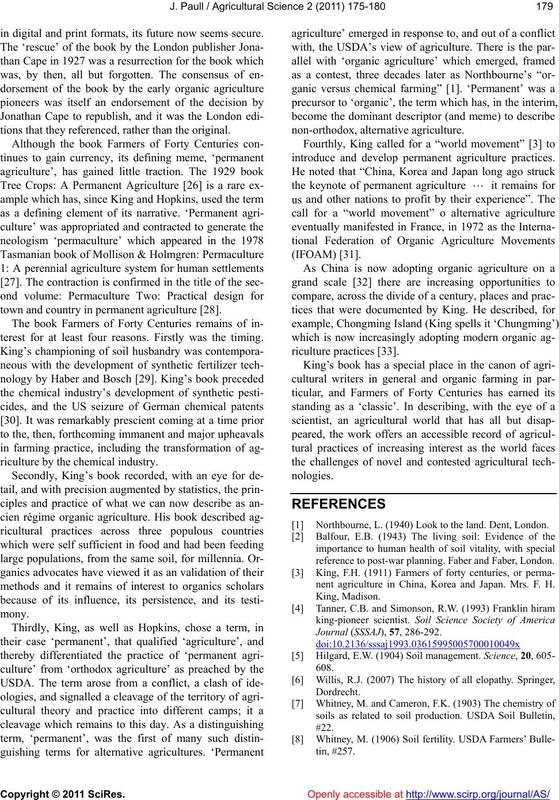 manent Agriculture’ to ‘Organic Farming’ (right) (Photo: J.
tion of new and improved methods” . of Forty Centuries in London in 1927 .
with editions appearing in five languages . 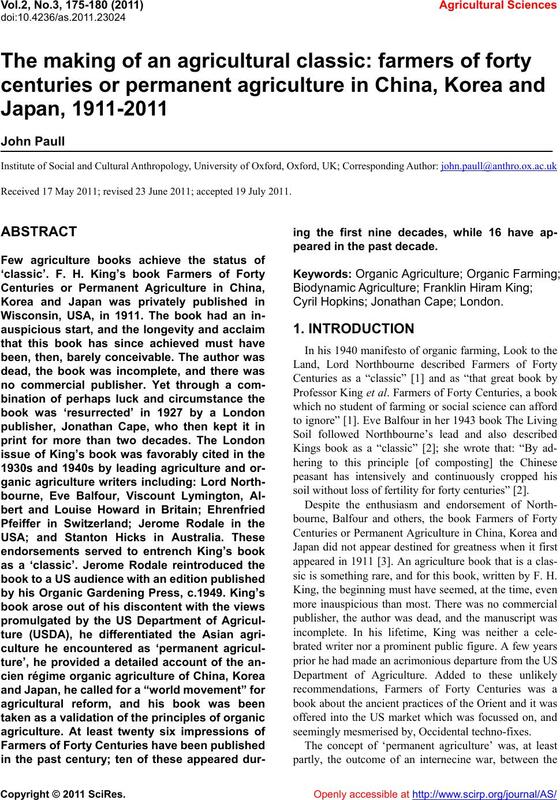 King’s Farmers of Forty Centuries. ard and Wad’s photographs  are strikingly similar. method - Chinese for short” . (none cited the first edition). sions in 1972, 1973, 1978, and 1990. Farmers of Forty Centuries, 1911-2010. 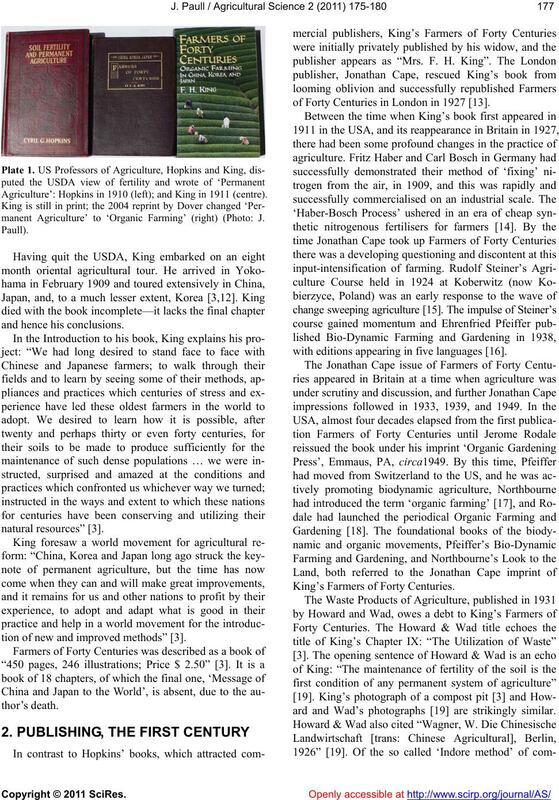 Farmers of Forty Centuries, 2001-2010.
cover of their book as a misleading anachronism. HardPress Publishing (2010); and Nabu Press (2010). has been uneven, but it is now enjoying a ‘golden era’. in digital and print formats, its future now seems secure. tions that they referenced, rather than the original. town and country in permanent agriculture . terest for at least four reasons. Firstly was the timing. riculture by the chemical industry. introduce and develop permanent agriculture practices. Northbourne, L. (1940) Look to the land. Dent, London. reference to post-war planning. Faber and Faber, London. 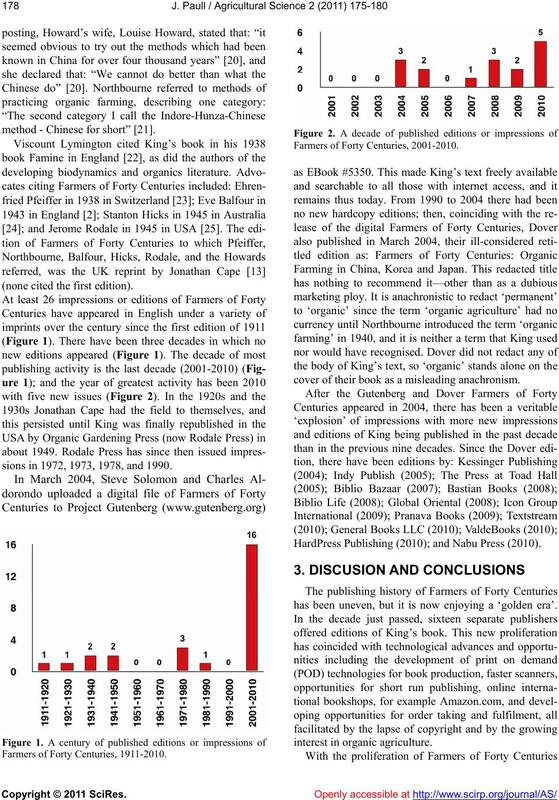 nent agriculture in China, Korea and Japan. Mrs. F. H.
culture. Ginn and Company, Boston. published edition, 1927). Jonathan Cape, London. bosch, and the transformation of world food production. 1924. European Journal of Social Sciences, 21, 64-70.
ford, Oxford University Press, London. Lymington, V. (1938) Famine in England. H. F. & G.
composts. Devin-Adair Company, New York. Smith, J.R. (1929) Tree crops: A permanent agriculture. A perennial agriculture system for human settlements. for town and country in permanent agriculture Stanley. high-tech. China Economic Review, 16.